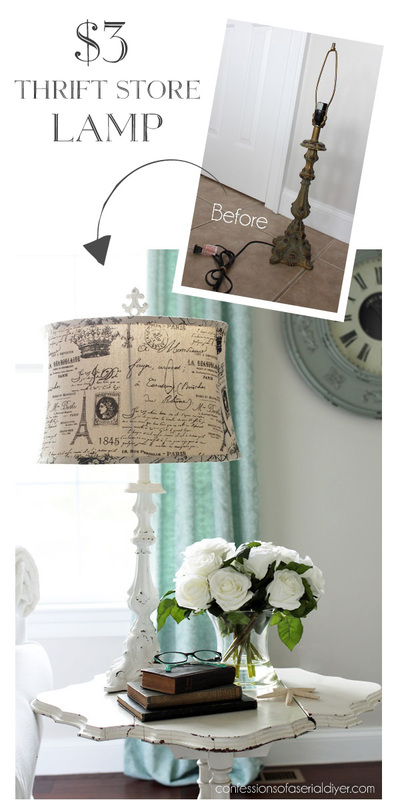 I decided that today I would share the little makeover I had planned to share for Trash-to-Treasure Tuesday. I ended up sharing my desk instead since I was able to get it finished in time. See it HERE if you missed it. 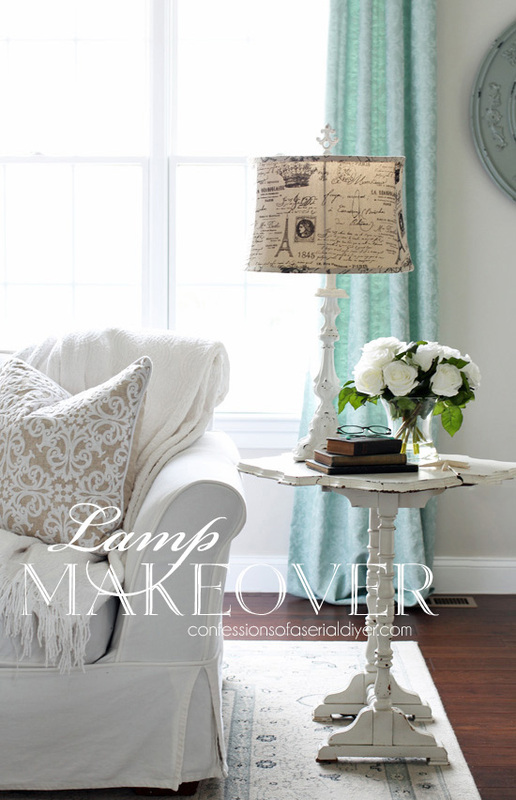 Today I am sharing a lamp makeover! What do you see when you look at this lamp? Apparently not everyone could see past the dated green and brown finish because I found this on clearance at the thrift store for only $2.98! My birdhouse lamps finally sold (hallelujah! ), and my booth is missing that soft light they provided. It is also missing most of its inventory ahem…working on that. So when I saw this lamp marked down to next to nothing, I knew it would be a great piece to make over. I painted this while I still had my Bit of Sugar by Behr (made into chalk paint of course) out from painting my china hutch. That was after one coat. Two coats did the trick. Then instead of grabbing my sand paper, I chose to wet distress. I chose to wet distress because there is a good chance that if I use sandpaper, I could take off more of the finish than I wanted. Because this lamp is not wood, it is likely a whitish color under that old finish, and I definitely did not want that peeking through. To wet distress, I just dipped an old wash rag in some water and rubbed where I wanted the paint to come off. I was able to control the distressing more easily as well. 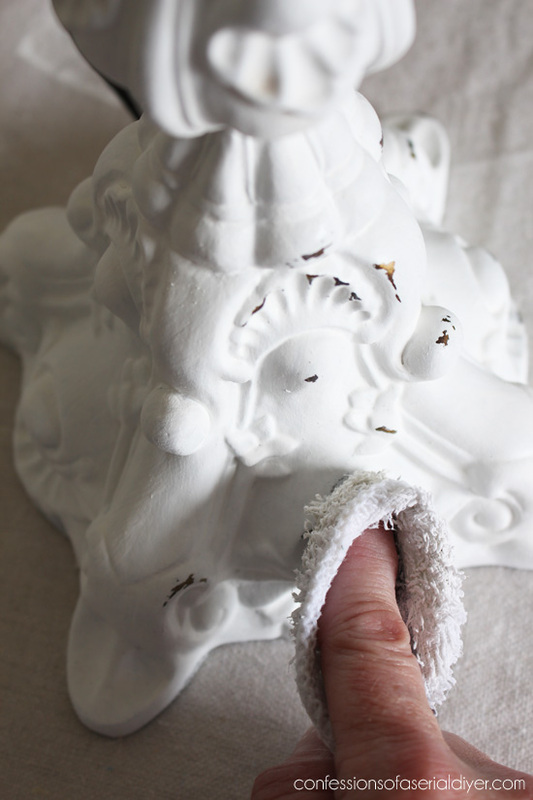 I sealed it with Annie Sloan’s clear soft wax. Look away from the bottom of the curtains in the background, I still need to hem them. I said look away ha ha. I have a few loose ends to tend to in this room. I’ll share it eventually, I promise! 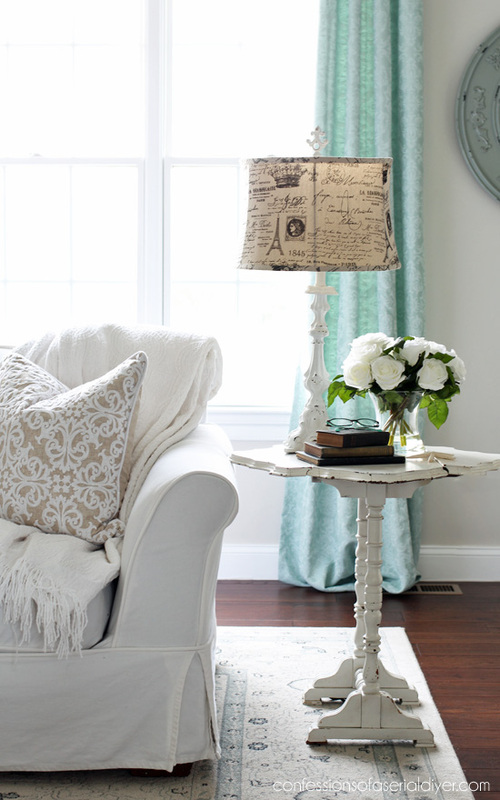 This shade came from Tuesday Morning years ago, but I have seen similar ones in HomeGoods from time to time, and At Home has a burlap version. The lamp I bought it for used to be in my old dining room but it finally bit the dust. This little lady will be heading to my booth soon! I’ll be back on Tuesday to share how I freshened this one up! Wow that is so cute, I love how that turned out. I have bought quite of few lamps from my thrift store, but none of them have turned out that pretty. What a great makeover! I have done some lamps similar to yours. Did you cover the lampshade? Its gorgeous! 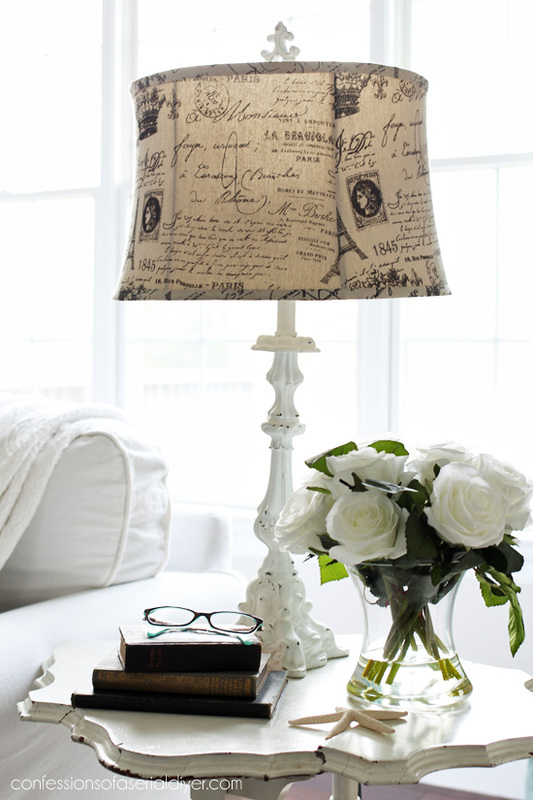 I have a few plain boring lampshades and was looking to do something like this. The lamp is beautiful and would be hard for me to sell. Love the shade also. Wet distressing is new to me but you know all the tricks to the trade. Well done. The lamp is so beautiful! It’s hard to believe it’s the same lamp as the original. It always amazes me the change paint makes. I LOVE THAT LAMP!!!! Way to to go and thanks for the idea!!! I never thought about using a wet cloth to destress… Oh how I love this happy place…and you too of course…Have a great wkend..
Love it! Sure wish I lived closer to your booth………and you! Enjoy your humor and yes, you caught me looking back to see your unhemmed curtains. 🙄 Would have never noticed them otherwise! Did you have to rewire it too? (Don’t tell me you know how to do electrical stuff too!!) I thought maybe you redid an old shade because that fabric looks like some of your other projects. You don’t sit still a minute, do you? I admire someone like you. I am glad you have a booth for all your “finds” you don’t use in your house. Go girl! I love the make over! 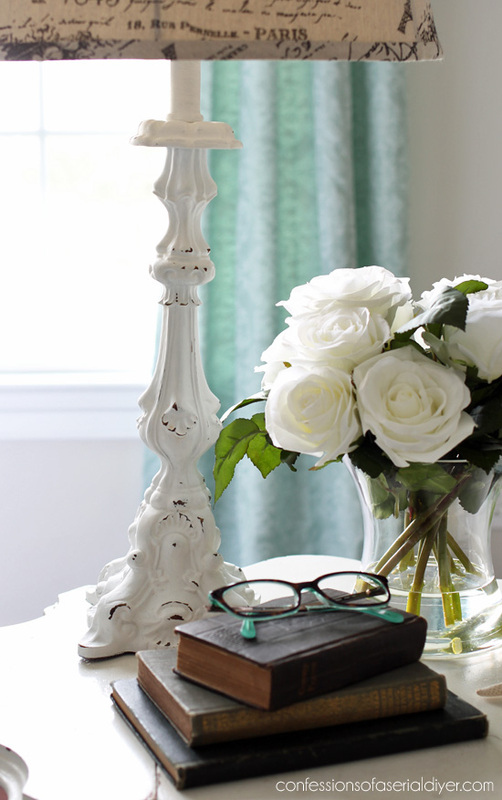 I have a similar floor lamp (garbage pick years ago) that I had painted black and it needs to be repainted. Ive been contemplating white vs black again. I think your choice of white is the way I will go! Ohhh I almost bought your bird house lamps when I was on vacation and visited your booth. I regretted not doing so as soon as we left but I did find some great buys there! We also discovered At Home and spent hours in there! I wish there was one close, tat store is amazing! Love it! I found a lamp in a pile of stuff for the trashman in front of someone’s house. (This area is known for putting out trash that you hope someone will take before the garbage truck arrives!) The lamp is similar in height to yours and the bronze-ish stuff is corroded and funky but kinda cool. I think I might try your technique on it. I am going to have a paintbrush in my hand this weekend anyway so no time like the present! So cute! I can’t wait to see the results of your painting marathon. That is just gorgeous. What a great find for $3. I have a floor lamp in my bed room that was a yard sale find for $2 or $3 I believe. It is brass and the finish has seen better days..You have inspired me. I think I will paint it white or perhaps Ivory. My question is when you did the wet distressing did you do that when the second coat of paint was still wet? I would like to try that on my lamp. Who would even notice curtains with that fabulous lamp to gaze at? Of course, once you mentioned them… actually, they don’t look so bad puddled. 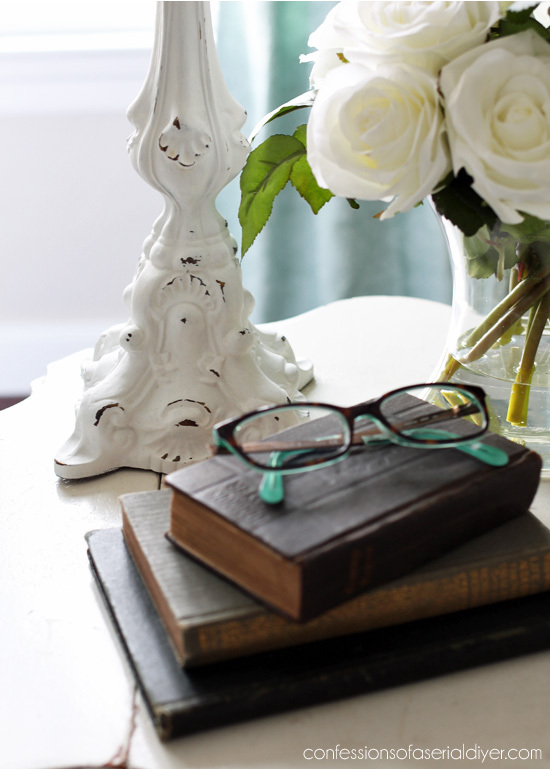 Have we seen that side table or is it new, too? Better start on another lamp, because that one’s going to fly out of the booth. Speaking of which, we’ll need another tour when you get it filled up. I just want to say that there’s not one project of yours that I don’t like. You are very talented. Because of you and your detailed instructions, I’m going to tackle slipcovering my sectional and I have bought a huge bag of calcium carbonate to give my old wood furniture a new updated look. Keep the ideas coming because they are very inspiring. I love the lamp. I love your style. I always look at pictures of your home for inspiration. I don’t think I’ve ever seen a project of yours that I don’t like. Very classy and beautiful and refreshing. That ugly old lamp is beautiful now! 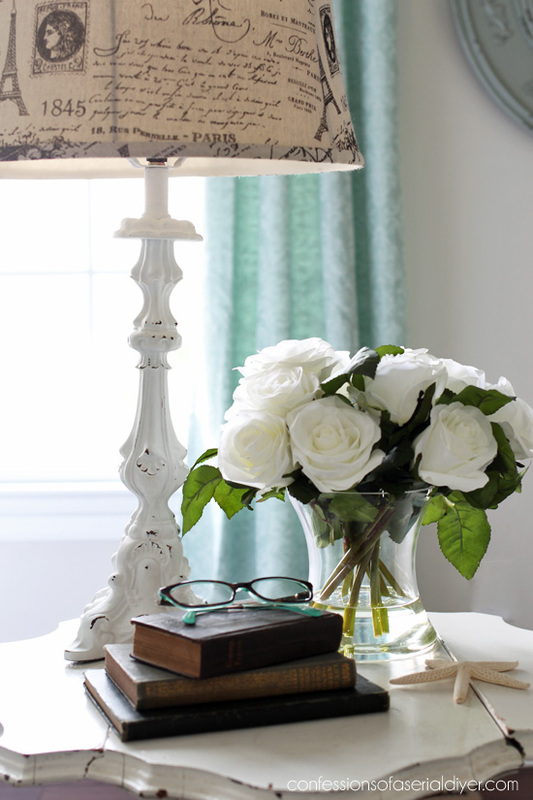 You gave it new life, and the lamp shade adds the perfect finishing touch. Actually, it matches the side table you have it sitting on. As far as the curtains, I would just leave them. I think the longer “puddled” look is perfect in that casual room. Looks like a million bucks to me! Oh, and where’s that feature wall you were talking about? Hmmmm. @. @ (As if you aren’t busy enough.) I’m hoping to setup a portable feature wall this weekend! Hehe. Love the lamp! I have two 40 year old tall brass candlestick style lamps that have been waiting and begging for some white chalk paint. You have inspired me! I know exactly what to do now! Thank you, Christy! 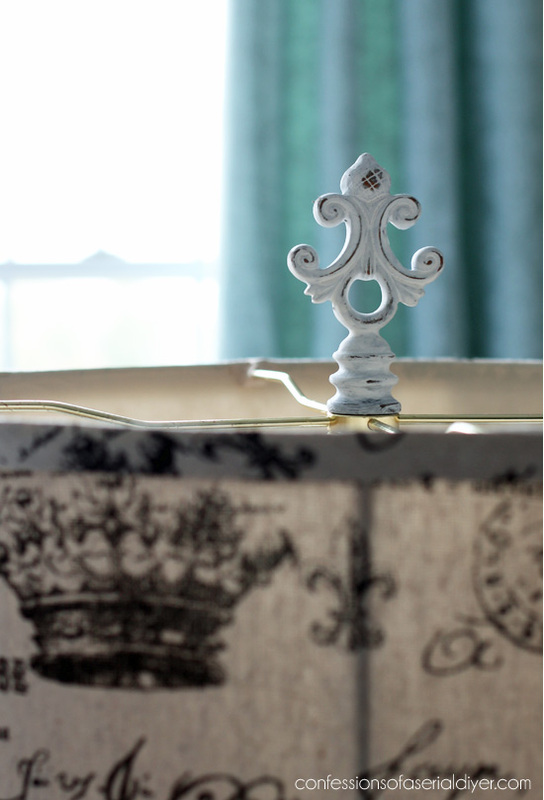 I love every bit of it from the finial to the table the lamp sits on.. Some times I can see what can be but also have problems converting sight to into being. What a great project and it turned out so pretty. I also recognize the fabric on the shade and would like to see a tutorial on recovering/replacing a shade. 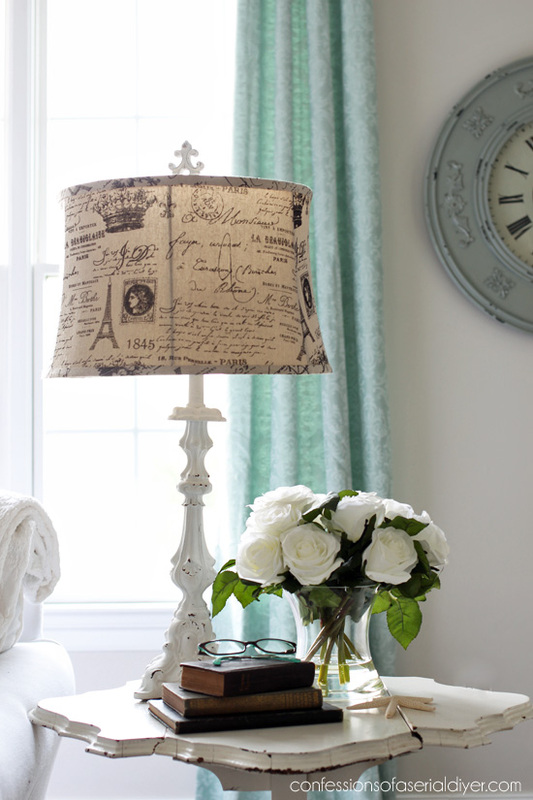 A good shade can be very expensive and has such a huge impact on the lamp and can be a great decorating tool. Can you do it? PS: I had a teacher in high school that taught us how to rewire a lamp, it is easy peasy but before you know it you will be keeping a lamp part stash! Keep up the good work! That is so pretty, I never know how you can choose what stays and what goes. Lol I would want to keep everything. A couple years ago I got two lamps kinda like that in a bargain pile(make a pile say a price.) They used to be gold but after seeing all your stuff I decided to paint them white. Oh how beautiful they turned out. Do you know what a inspiration you are to alot of people? Look forward to every Tues. and Thursday…..
Just gorgeous! It’s amazing what transformations white paint can make! The lamp now looks very on trend and expensive, especially with that particular shade. Great job! It looks so much better in white and love the shade on it!!!! Oo-la-la! Tres jolie! Turned out beautifully. I hope you have another one to put in your booth because I don’t think it will last long! Christy, You finish everything so quickly . So beautifully done . 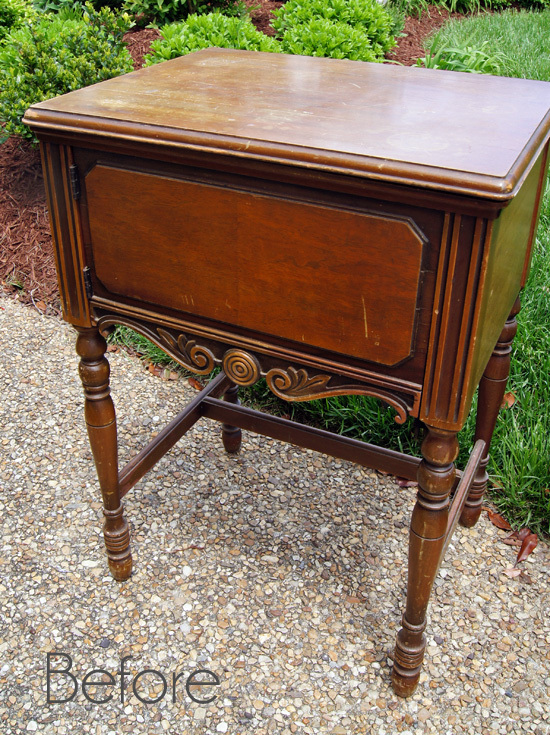 How many pieces of furniture would you say you have done sense you first started chalk painting ? I enjoy keeping my eyes on your work . . . wait to see what you are up to next. I must have missed this makeover of yours- just found it. And I LOVE it! 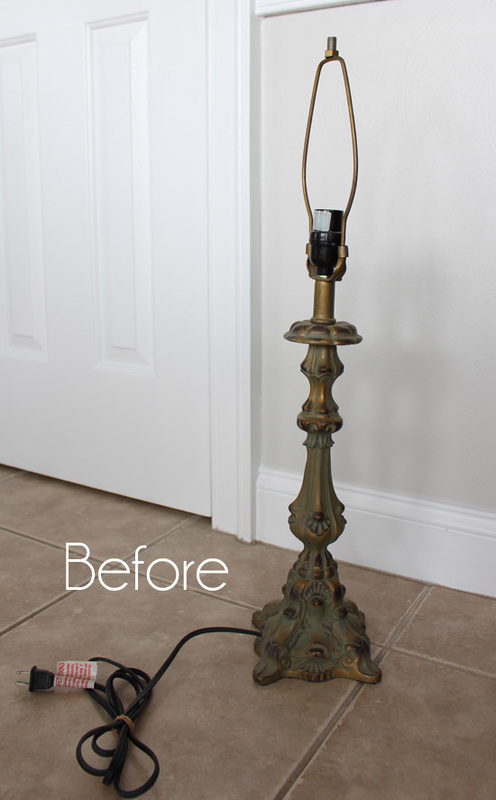 Beautiful job giving that old lamp a gorgeous new life! I thought I recognized that lampshade! 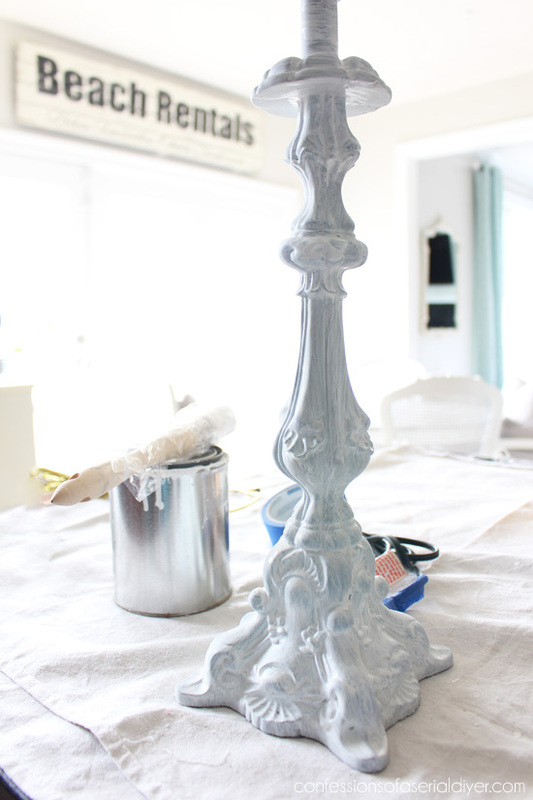 What a difference some white paint made to this old lamp – all those lovely details just pop now. I’m surprised you didn’t keep it in your new home! I bet it won’t last long in your booth.